EAST NEW YORK, Brooklyn (WABC) -- Police are searching for a driver who fled the scene after a pedestrian who happened to be a popular radio DJ was struck and killed in Brooklyn Monday morning. 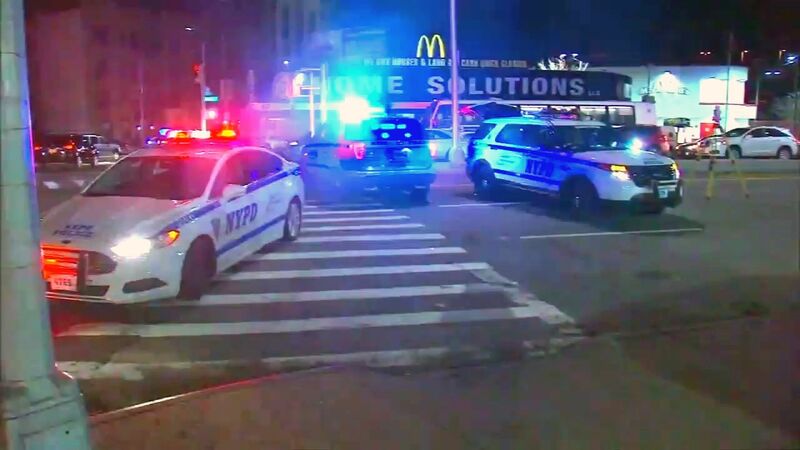 The victim, 39-year-old Jean Paul Guerrero, also known as DJ Jinx Paul, was hit while crossing Jamaica Avenue and Sheffield Avenue in East New York just after 4 a.m.
EMS responded and took him to Brookdale University Hospital, where he was pronounced dead. Guerrero worked on Mega 97.9 FM in New York City. DJ Jinx Paul won awards and was loved for his work on Mega 97.9 FM radio, but as big as his presence on the air was, he was so much more. "Jinx Paul was a person who cared for everybody, a person who always tried to find the best in any kind of situation that could be the worse situation in the world, and he'll find a way to make us laugh and make us enjoy ourselves and have fun, and see the light at the end of the tunnel," said Juan Vargas, co-worker. "He was bigger than life," another co-worker said. Guerrero was struck by an unidentified black sedan while crossing the street, according to the NYPD. Police released video of the vehicle Monday night. The NYPD released this video showing a car believed to be involved in a fatal hit-and-run-crash in Brooklyn. Friends say he was a towering figure who spent his 39 years trying to help others become successful in the music business, through his work with IamLMP Productions. "He was a builder, he was an entrepreneur, he was a dreamer and he had big dreams, and he wanted to share that dream with the whole world," Vargas said. "I'm at a loss for words. I'm still in shock," a co-worker said. Police are looking for a woman, possibly driving a Nissan Maxima with severe front-end damage. It was last seen speeding westbound on Jamaica Avenue. Investigators will be checking surveillance cameras in the area to try and get a glimpse of the vehicle involved and its license plate. Anyone with information is urged to call CrimeStoppers at 1-800-577-TIPS (8477) or for Spanish, 1-888-57-PISTA (74782).